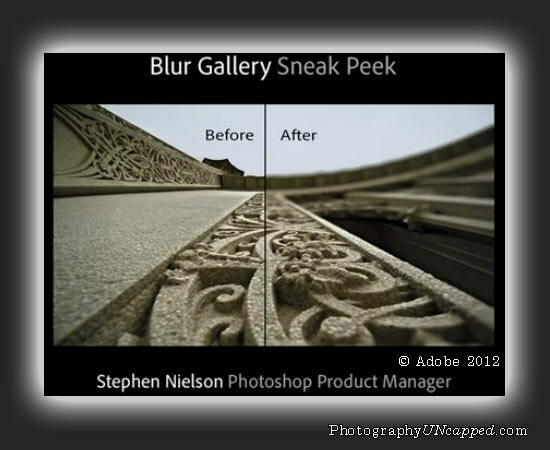 Stephen Nileson, Photoshop Product Manager, has released another in the series of Sneak Peek videos showing features in the making. Updated: Adobe has Just announced the release of the Official Photoshop CS6 Beta. Everyone expects this to be included in the as yet not officially announced Photoshop Next, CS6. This feature basically simplifies the blur effects that are so ‘in’ these days, which can make it seem that there is a shallow Depth-of- Field in a given shot. It’s easy to control and to apply the effects to an existing image, without having to work with extensive manipulations. The dialog simulates an adjustable iris that can be moved and shaped to change where/how the effect is applied. It doesn’t quite look the same as the natural bokeh (out of focus rendering) of a fine quality lens, but it looks pretty good, and is easy to use after the fact. No Spam! – We hate spam too. It’s certainly an easy/easier way to control defocus after the fact.